Guangzhou, China – 20 March 2019 From April 4 to April 8, Catch invites Chef Peter Van Es, the Brand Ambassador of Stockyard, to present local guests the most reputable wagyu beef with his well-trained cooking skills. A lavish feast of Wagyu beef will be presented at Catch by using Wagyu and Angus Beef provided by the most prestigious beef brand Stockyard. Born in Sydney, Peter Van Es, worked under a well-known Michelin Star Chef Michel Roux in the UK and then moved back to hometown for higher career pursuit. For over three decades, he accumulated lots of cooking experiences and gained 14 national awards. “Simple food, cooked well” Van Es says. “My food is for those who believe quality of a dish comes from accumulating the freshest of ingredients”. Back to the beef, Stockyard specializes in the production of long grain fed Angus and Wagyu beef using non GMO feedstuffs and no hormone growth promotants. All the wagyu cattle are fed by grain in the feedlots located in the Southeast of Queensland for excess of 400 days to ensure best quality. Among them, the marbling level at M9 Kiwami Wagyu beef is famous for its combination of silky flavors, tenderness, taste and juiciness. According to different parts and texture, Chef Peter creatively designs a selection of Wagyu beef dishes that cooked in variety styles. Chuck Tender in a smoked way, the flavor will be fully enhanced by the smoked aroma. To grill Wagyu striploin with perfect marbling can both keep the gravy inside and bring up a fantastic taste. The most excitingly, he intensively turns Wagyu beef into sweet flavor in sugar cured way and even puts into French style dessert. With the stunning night view at Catch, it must bean ultimate dining experience that you have ever had. From April 4 to April 8, Chef Peter Van Es will present a sumptuous feast of Wagyu Beef at Catch. Price is at CNY 888 per person for a set and subject to 15% service charge (applicable government tax included). Both set menu and a la carte menu will be served until May 5. In order to satisfy guests’ craving for premium beef, Catch will also launch a Sunday Brunch for only one day on April 7, presenting an extensive choices of fresh salad, seafood, dessert and Stockyard beef dishes. For details and reservations, please call Catch at 86 (20) 8883-3300. As the world’s leading operator of luxury hotels, Four Seasons Hotels and Resorts currently manages 111 properties in 47 countries. 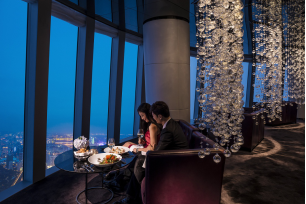 Open since 2012, Four Seasons Hotel Guangzhou is the preferred address for both business and leisure travelers delivering personalized and anticipatory service. Recent awards and accolades include Five Star Hotel by Forbes Travel Guide, Hotel Gold List by Condé Nast Traveller’s China and Top 10 Luxury Hotels by Travel & Leisure. For more information on Four Seasons Hotel Guangzhou, visit press.fourseasons.com/guangzhou.